In this activity, students work with paleoclimate proxy data (d18O, CH4, CO2)from the Byrd and GISP2 ice cores to investigate millennial-scale climate changes during the Last Glacial/Deglacial time periods. 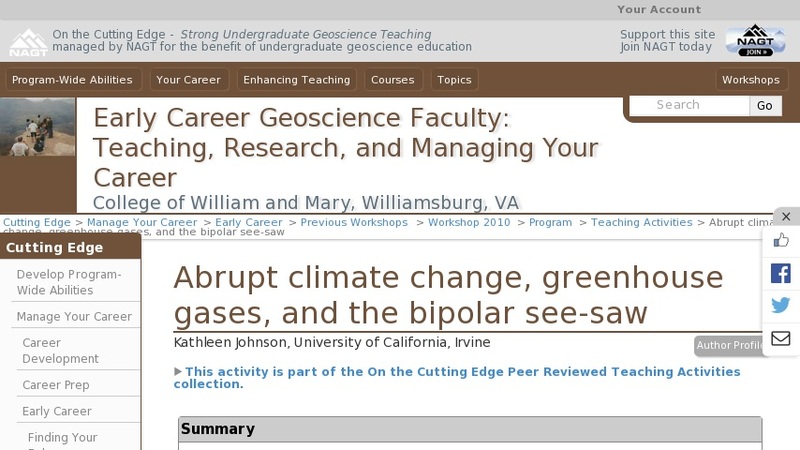 Students must prepare a publication quality plot of the data and answer several questions about the similarities and differences between the time-series (north-south phasing, amplitude, symmetry) and use this information to assess the bipolar see-saw mechanism for abrupt climate changes. Students are encouraged to read two journal articles for more information and to synthesize their results with other information from lectures and earlier readings.